Get Miriam Moore’s advice for planning, drafting, and revising sentences and paragraphs—even when you aren’t online! A portable print text, Real Skills Essentials works together with Writing Essentials Online to deliver just the support necessary in order to develop sentences and paragraphs. 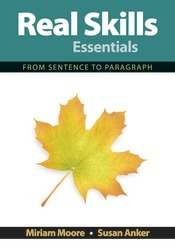 It can be packaged with Writing Essentials Online at a significant discount.